Quebec, for many years, has been a melting pot of various cultures, languages and customs. There was even a time when Francophones were justifiably worried they would lose their language and culture as time went on. However, Quebec has instead grown to accept herself as a true bilingual state. Although still aware of her need to protect the French culture, she accepts her English side as well. And yet, there are still political parties set on making language an issue once again. Apart from tuition fees and ensuing riots, recent news in Quebec revolves around the notorious “pastagate” and the effects Bill 14 will have on our society if the PQ government successfully passes it through the National Assembly. Colin Standish is a third-year law student at Université de Laval. He is president and Editor-in-chief of the Revue Juridique des étudiants et étudiantes de l’Université de Laval. Last week, Standish was also on the popular Quebec television show Tout le monde en parle to speak out against this bill. 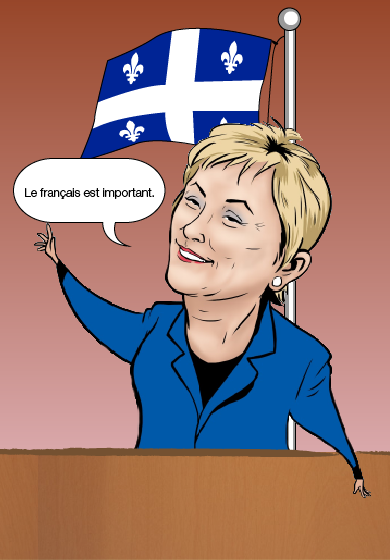 ‘‘Bill 14 is an amendment to the Charter of the French Language. But the government is not actually protecting French, it’s taking away the rights of other groups,’’ said Standish to The Concordian. For example, one of the proposed laws is to strip the bilingual status of those Quebec municipalities and boroughs that are composed of 50 per cent or less Anglophones. The mayors of these municipalities decided they would not go down without a fight. Last week, Pierrefonds-Roxboro got the majority of the Union of Quebec Municipalities to help defend its bid to remain bilingual. Even Francophone mayors supported the decision. Longueuil is considered a PQ stronghold but it too is backing Pierrefonds-Roxboro. It is also actively supporting its own borough, Greenfield Park, in its quest to remain bilingual. Ironically enough, the bill also has legislation that would hinder Francophones. The bill proposes to base the CEGEP application process on the language spoken by the students’ parents. Anglophone CEGEPS will have to accept all Anglophones applying before considering Francophone applications. ‘‘The application process will not be on academic merit anymore and so this will reduce the quality of education in Quebec,’’ said Standish. According to him, another highly contentious aspect of the bill is the right it will give to the Office Québécois de la langue française to search and seize ‘‘anything from your business without warning’’ if they find it objectionable. After “pastagate” blew up in the OQLF’s face, other businesses came forward to recount their run-ins with them. The general idea was that even ‘‘on/off’’ labels for light switches needed to be changed to French. Does that mean the proposed seizures would include anything remotely English? Twitter erupted with both English and French speaking Quebecers mocking the OQLF over the pasta debacle. This unity of voices alone shows that there is solidarity between Francophones and Anglophones in Quebec, despite what seems to be an effort by the PQ government to create new divisions between them. The PQ is wrong in thinking that French will die off in the future if we don’t take strong action today and expand Bill 101. According to Statistics Canada, new immigrants seem to be eagerly adopting French as their main language in 2011. It is actually their use of English that is waning. The PQ government is trying to reinforce their base of Francophones for the coming elections, but Bill 14 is not achieving its intended objective. Rather, it will only appeal to those few xenophobic cells that still persist in a largely accepting Quebec. Francophones in general will not rally behind them as they once would. Instead, they’re rallying behind the Anglophones and fighting back.